Posted By:@AVGJOhanna | At:9:40 PM Be the first to comment! A while back, I read a post on my Facebook news feed about Jalen Rose starting a school in Detroit. A pretty interesting story that I thought I would read but the very next line annoyed me to a point that I rolled my eyes and ultimately did not read the story, at least not that version of it. 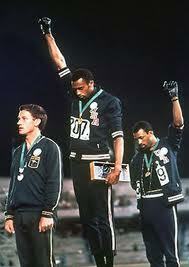 The next line was a question about whether more black athletes should do the same? Now that I am writing this I seem to recall another post directly asking about how black athletes should donate their money. That irritated me even more. While working out this past weekend, I watched The Melissa Harris-Perry show about sports, politics and black athletes. One of her panelists was the legendary Dr. John Carlos, who is famous for his, along with Tommie Smith, Black Power salute while on the medal stand in the 1968 Olympics. This particular gesture is heralded as a courageous moment in the struggle. I appreciated the thought provoking discussion on the MHP show. Yet there was a moment in the conversation where I again became annoyed. Michael Jordan's comments about Republicans buying shoes too was referenced and contrasted with the efforts of other athletes both prominent athletes and the not so prominent. Why the irritation? Perhaps with MJ, I am a little biased. Growing up next to Chicago in Gary, Indiana, during his tenure with the Chicago Bulls, I was a big fan. A mega Bulls fan as a matter of fact. Even though I lived in a different state with its own NBA team, the Chicago teams were considered our home teams because of the proximity and the fact that Gary is in the Chicago area media market. Those were the only teams we actually saw. So yes I like MJ. He has his flaws but I like the guy. The Republican-shoe comment was not his finest moment, but he is now caricatured as if he has no conscience regarding the black struggle? As I was leaving the gym, one of my first thoughts was "Didn't he help bankroll the production of Malcolm X?" When I got home, I looked it up and sure enough he was one of the investors. I started recalling his celebrity golf tournament, which continues to this day. A tournament that raises millions of dollars for worthy causes, including causes that help under served communities. Yeah his in-artful comments rubbed some people the wrong way. He stepped in it but to say that he hasn't left a positive legacy or that his actions has taught others to be "benign" is not a fair assessment of him as a man nor of his accomplishments as professional athlete, in my opinion. The intent of this essay is not to defend MJ, but to use this recent discussion as an example that not every one contributes to the cause in the same manner. Why are we asking if other folks should build a school like Jalen Rose did? Why are we trying to tell other people what to do with their money? That is insulting on a number of levels. Whether your income is little or great, how you spend it is your business and not left to any one's judgment. It is great for some to make large donations to worthy causes. It is great for some donate their time to worthy causes. It is great for some to actually create organizations and erect buildings for the purposes of serving under served communities. It is great when an athlete uses his/her platform to affect social change. We need all of it. Why is one act deemed greater than another? Why is there an expectation of cookie cutter activism? Why is there conversation about how someone else should spend their time and money? How about a conversation that encourages all of us to contribute? A conversation that compels each of us to give of our time and resources. It saddens me to hear people be so critical of other people, especially prominent people as if nothing they do will ever be good enough. We have clear examples of the not-so angelic athlete. We also have examples of athletes whose talent and skill inspires youth to become involved and persist in sports, even though the odds of becoming a professional athlete are not in their favor. Some may deem that as a waste of time. But they do not consider all of the other life skills and qualities (that we actually value) that are developed as a result of playing a sport like: discipline, teamwork, leadership, confidence, resilience, sportsmanship, healthy competition, fairness, mental toughness, etc. Young girls are less likely to tolerate abuse. Add on the fact that the field, the court, the gym, the mat, the pool often times becomes a place of refuge when the rest of their world is not optimal. Add to that the fact that many have unlocked a talent that could send them to college, which can lead to additional opportunities. What about the escape these athletes provide to many of our adults that just need a break from the daily grind? What about the unifying power of sport? Really consider the impact sports have had on the advancement of race relations and inequality in this country and around the world. If an athlete never utters a word in support of human rights and social change, I posit to you that their talents have a far reaching impact perhaps beyond what we can describe.